PICTURED ABOVE: A Graduating Senior at Uplift Education's College Signing Day 2015. Uplift Education is making the college dream a reality for hundreds of first generation college attendees each year! Keith Lott, a Talent Recruitment Strategist says working for Uplift Education has one perks that will make you feel proud to go to work every day. Why is this something you want candidates to see? Uplift Education's mission is 100% College Acceptance and we are proving that it can be done with low-income and minority student populations. What type of candidate will appreciate this? 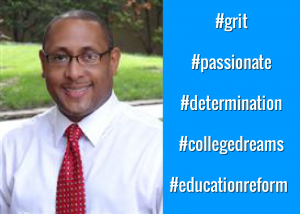 Passionate, mission-aligned teachers that believe that all children can go to college. Anything else you want to share? Commit to College: Uplift Education is committed to building a brighter future – one student at a time. We do this by creating quality, college preparatory public schools in underserved communities. Each student must be accepted into a two- or four-year college institution in order to receive their diploma from an Uplift high school. Interested in learning more about working for Uplift Education? Visit Keith Lott's recruiter profile and learn more about the company and how to apply TODAY. CLICK his profile to learn more!